On Tuesdays, I run a classic film screening. On Fridays, I write about these movies. 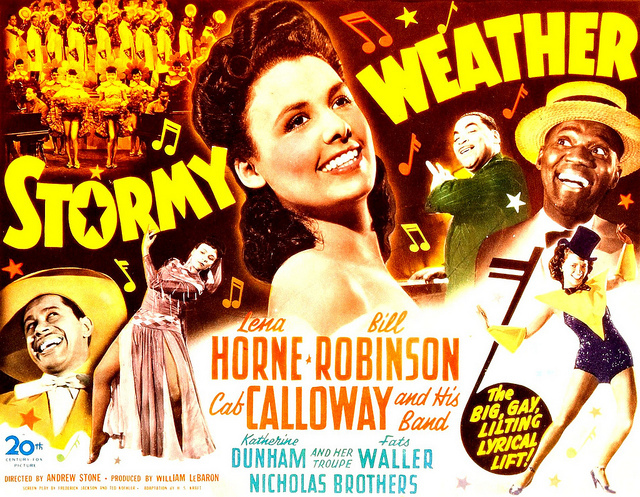 This week’s film: Stormy Weather (1943) – directed by Andrew L. Stone; starring Lena Horne and Bill Robinson. Stormy Weather is easily one of my favorite musicals. This is in part because I find Bill “Bojangles” Robinson’s career to be immensely fascinating. The step dance – sans Shirley Temple – is one of my favorite tap routines. Some days I easily get sucked into watching it repeatedly on YouTube. Stormy Weather, loosely based on Robinson’s life, is his last film. Lena Horne and Dooley Wilson co-star as his love interest and perpetually broke friend respectively. The film also features Cab Calloway, Fats Waller, the Nicholas Brothers (definitely watch that dance number before you go to bed), and Ada Brown as themselves. Essentially, Stormy Weather is a who’s who of Hollywood’s best African-American performers from the 1940s and the payoff is remarkable. There is resounding electricity with every song and dance number, found so rarely in the standard classic Hollywood musical. Stormy Weather is truly the sum of all its parts.